Old Time Hockey new arcade sports game - with beer mode! Old Time Hockey, a game that harkens back to old-school arcade hockey of yesteryear where blood on the ice is just another day at the rink. 70s afros, big moustaches, no helmets, dirty hits, bench-clearing brawls, goalie fights, stick fights, ref abuse and literally lighting it up– that’s right - aggressive hockey is back in town! Old Time Hockey will release in early 2017 on PlayStation 4, Xbox One, and Steam. Old Time Hockey is inspired by classic arcade hockey games and sports titles. “Everything from NHL 94, Blades of Steel, to other sports titles like NBA Jam and Tecmo Bowl inspired us. We wanted to recreate that old familiar experience of playing these games on the couch with friends." says Director Karthik Venkateshan. The game will feature 5-on-5 arcade style hockey gameplay where players will their opponents to submit through rough and tumble aggressive hitting and fighting. From donnybrooks to stick fights, Old Time Hockey delivers an experience straight out of the pages of hockey’s history! 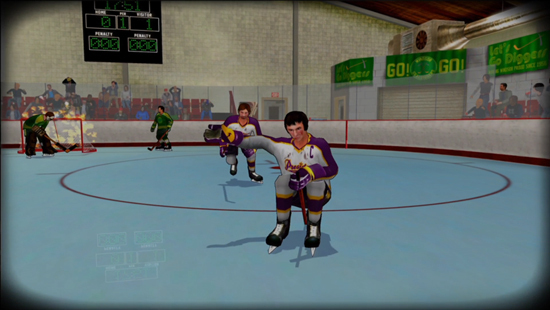 Players will also get to experience a unique Story Mode in Old Time Hockey, something which has never been seen in a hockey video game. “We also developed a hilarious story mode to wrap all the hijinks together. It's a daring concept to incorporate narrative into a sports game but we think players will get a kick out of it." Set in the late 1970s amidst a poor economic climate and during the peak of the disco era in the United States, Old Time Hockey underscores the arduous story of a struggling team in the Bush Hockey League. With various control schemes to choose, players can use arcade 2-button controls to more modern controls. In addition to these familiar controls, a unique “Beer Mode” control scheme allows players to play with one hand and hold their drink in the other! More on the game can be found at: www.arcadehockey.com.